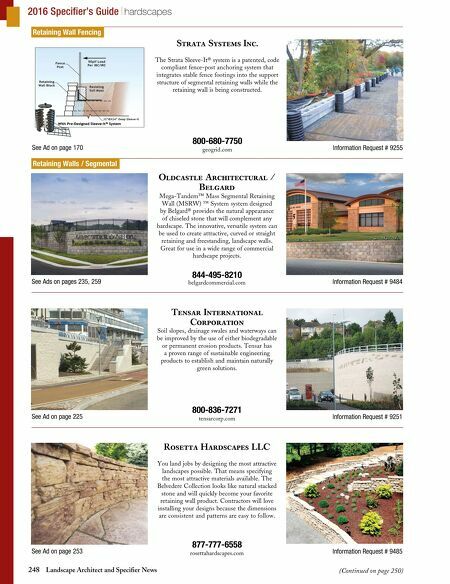 248 Landscape Architect and Specifier News 2016 Specifier's Guide hardscapes Retaining Wall Fencing Retaining Walls / Segmental (Continued on page 250) See Ad on page 170 Information Request # 9255 Strata Systems Inc. 800-680-7750 geogrid.com The Strata Sleeve-It® system is a patented, code compliant fence-post anchoring system that integrates stable fence footings into the support structure of segmental retaining walls while the retaining wall is being constructed. 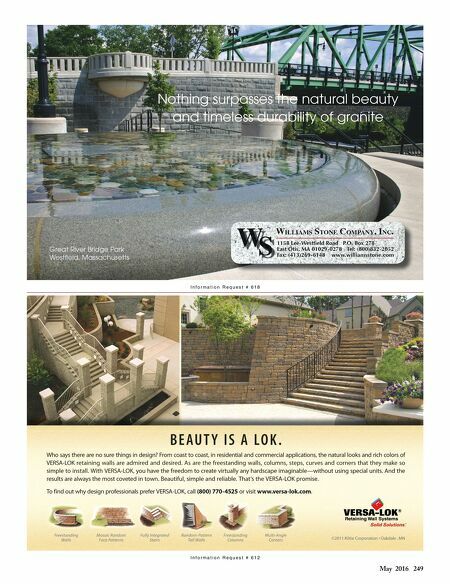 See Ads on pages 235, 259 Information Request # 9484 Oldcastle Architectural / Belgard 844-495-8210 belgardcommercial.com Mega-Tandem™ Mass Segmental Retaining Wall (MSRW) ™ System system designed by Belgard® provides the natural appearance of chiseled stone that will complement any hardscape. The innovative, versatile system can be used to create attractive, curved or straight retaining and freestanding, landscape walls. Great for use in a wide range of commercial hardscape projects. See Ad on page 225 Information Request # 9251 Tensar International Corporation 800-836-7271 tensarcorp.com Soil slopes, drainage swales and waterways can be improved by the use of either biodegradable or permanent erosion products. Tensar has a proven range of sustainable engineering products to establish and maintain naturally green solutions. See Ad on page 253 Information Request # 9485 Rosetta Hardscapes LLC 877-777-6558 rosettahardscapes.com You land jobs by designing the most attractive landscapes possible. That means specifying the most attractive materials available. The Belvedere Collection looks like natural stacked stone and will quickly become your favorite retaining wall product. Contractors will love installing your designs because the dimensions are consistent and patterns are easy to follow.